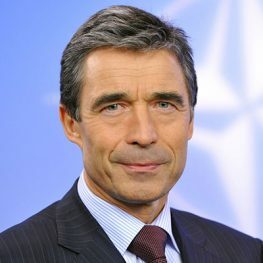 Anders Fogh Rasmussen – North Atlantic Treaty Organization’s 12th Secretary General and Prime Minister of Denmark (2001-2009). From 1987 to 1992 he was Minister for Taxation and from 1990 to 1992 also Minister for Economic Affairs in the Conservative-Liberal coalition Government. As Minister for Economic Affairs and member of the EU’s ECOFIN-council 1990-92, Mr. Rasmussen was the Danish negotiator of and signatory to the Maastricht Treaty which eventually led to the introduction of the single currency, the euro. In 2001 he formed his first government that was later re-elected in 2005 and 2007 respectively, and he held the position as Prime Minister until he was elected as future NATO Secretary General at the Strasbourg-Kehl Summit in April 2009. During the Danish Presidency of the European Union from July to December 2002 Mr. Rasmussen played a key role in the process leading to conclusion of the accession negotiations with 10 candidates for EU-membership at the meeting of the European Council in Copenhagen in December 2002.